Millennium Cone - Bray School Project N.S. 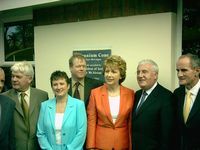 This project is a sculpture created by Robert McColgan at the invitation of former principal, Kieran Griffin and was financed through Millennium Project funding. The Cone symbolises child learning and growing, their life marked by ceremonies, celebrations and different life events. The space and form of the Cone recall early Celtic mounding and hollowing. It connects our present with our past and our future. 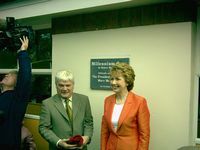 On Friday 1st October 2004 , the school was honoured to have President Mary McAleese come to the school to officially unveil the Millennium Cone. 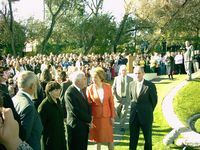 Though the weather was conspiring against us, a two hour spell of sunshine greeted the President upon her arrival. 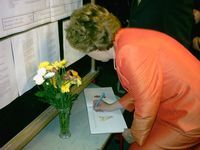 She was warmly welcomed by the school staff, pupils, parents and members of the local community.